This is not your mother’s Game of Life. In The Game of Life: Twists & Turns , no longer is your only choice whether to go to college or not. You don’t follow the same predetermined roads game after game like you did in the original Life. The Game of Life: Twists & Turns looks very different compared to its non-flashy predecessor. The elements of choosing a career, Life tiles, and making bank to win are still there, but the game play is completely revamped from what you knew in regular Life. First of all, in lieu or making your way all the way through the board from start to finish, you get to decide how long you will play. You enter the number of “years” (turns!) your group wants to play in the game’s LIFEPod and the device keeps track of the turns automatically.Want to get Game of Life: Path To Success for the PC FREE and LEGAL? Click here, open a FREE trial GameHouse FunTickets account and it’s yours today! Click for more info. Everyone starts with a strikingly unrealistic salary of $5,000 a year (or turn, if you still haven’t caught on to the gamespeak). On your turn, you may navigate your skateboard (yes, you read that right) along any of the four paths you please: Love It!, Live It!, Earn It!, or Learn It! You may even choose to refresh your course and warp to another category’s start space at the beginning of a turn. If you land on a blank space, a Life card is drawn (the equivalent to the former game’s tiles), and the instructions are followed. Perhaps you’ll invent a board game that someone will write about on Boardgame Beast and score $900,000, or get into a ski accident and lose 300 Life Points. What are Life Points? Life Points are the other aspect that matters in this game besides money. You get them from drawing cards, getting married, having kids, and so on. The ones on cards you’ll enter into the LIFEPod yourself; events like getting married will be kept track of automatically. You may never get the chance to upgrade your skateboard to an actual car or live in a house in Game of Life: Twists and Turns. Whereas in the original game you were forced to stop and do these things, acquiring a car or home will only come from luck of the spin. Even if you do happen to land on one of these purchasing spaces, trading in your eco-friendly wheels or ditching your supposed cardboard box is optional. So you travel around the board with almost complete independence, building a family in Love It!, feeding giraffes in Live It!, feeling the need for greed in Earn It!, pursuing degrees in Learn It! (which are necessary to advance your salary in some careers), or some mix therein. The winner is the player with the highest calculated computer score at the end of your turns. The game uses a "secret formula" of a different ratio of worth for both money and Life Points each time. 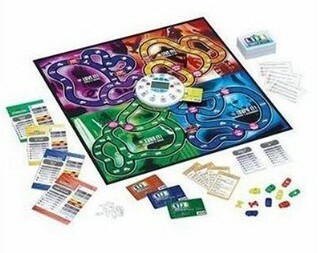 The Game of Life: Twists and Turns is a great game for most anyone to play again and again. It’s a lot more interesting and innovative than the original version of Life and mandates a lot more strategy to win. My only complaint is that those who mainly stay in the Earn It! Section usually win, buying into the superficial idea that money is what matters most in Life. I’m also surprised only four people can partake in this game; I don’t think it would have been that hard to manufacture a couple more plastic skateboards and cardboard Visa cards (what you use to feed the LIFEPod). Also, one player must always be red when playing Twists & Turns for the LIFEPod to work properly, and red always goes first. I guess a $30 game can only be so high-tech. The Game of Life: Twists and Turns is a fun choice for families and board game lovers. 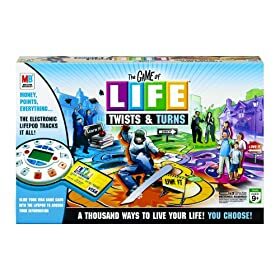 Don’t purchase this game thinking you’re getting the original Life, because you’re not. And that’s a good thing. This updated game is so much better than the origional. A great game that will provide lots of fun. Much more realistic than the first and it should be in everyones game cubbord! Join in and write your own page! It's easy to do. How? Simply click here to return to Review your favourite boardgame!.